A look at the ruined reminders of the Romans’ time in Britain. In the Telegraph. Hadrian's Wall was built to keep "intact the empire" imposed upon Hadrian by "divine instruction". Although it's thought to have been built primarily to separate the 'civilized Romans' from the 'northern barbarians', it's probable that there were other, more mercenary reasons, for there were also toll gates to tax travelling merchants. 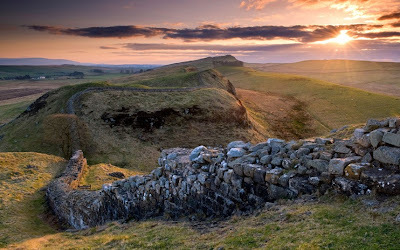 Hadrian's wall (122 AD) ran 120 kms from Wallsend (Segedunum) to Solway Firth. But it was the southern Roman wall. Another, further north was built in 142 AD (Antonine Wall) from the Firth of Forth, but little remains of this wall built only 20 years earlier. (Source Wikipedia). Bath is perhaps the most famous Roman site in GB. It's certainly a city worth visiting, not only for its Roman Bath still in remarkable condition. In fact it was still used during the 18th and 19th centuries. Bath prides also some superb Palladian architecture, crescents of Georgian residential buildings such as the Royal Crescent (1770) designed by John Wood the elder and the younger. There are also bridges worth seeing such as Robert Adam's Pulteney Bridge based on a design never used for the the Rialto Bridge of Venice. There's Bath Abbey (1499) founded on the site of an 8th century church. There's the Sally Lunn Bun, and for the amateurs of beer, perhaps Somerset brews some of the best beers to be found in the UK. They even have annual beer tasting sessions in various pubs of Somerset, taken just as seriously as wine tasting is in France..
Great to know. Nice photograph.